We’re still doing out best to help clarify all of the new tiered data questions that you have come up with, and we think we’ve got another situation worth mentioning. We first reported last week that unlimited 4G LTE customers would have a separate unlimited tethering package that would cost $30 per month, but some of our 3G readers were wondering if they could eventually get into that. 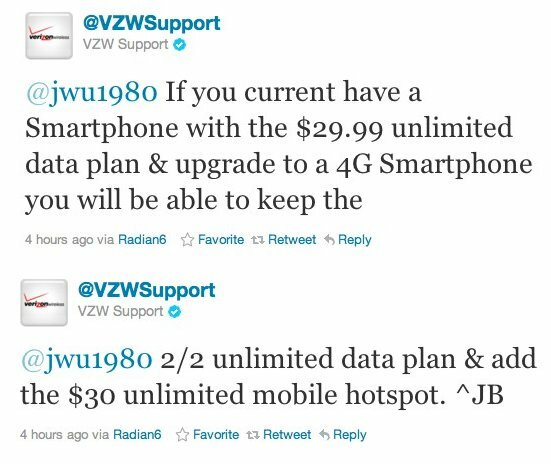 The answer is “yes” according to @VZWSupport. As long as you locked into an unlimited smartphone plan by the end of yesterday, you will also be able to keep it and grab the unlimited tethering plan when upgrading to a 4G LTE phone. Motorola XOOM To See Android 3.2 In A Matter Of Days?